There’s just something about otters that fascinates me. They are so sleek and supple. They swim like fish and have a way about them that reminds me of cats. 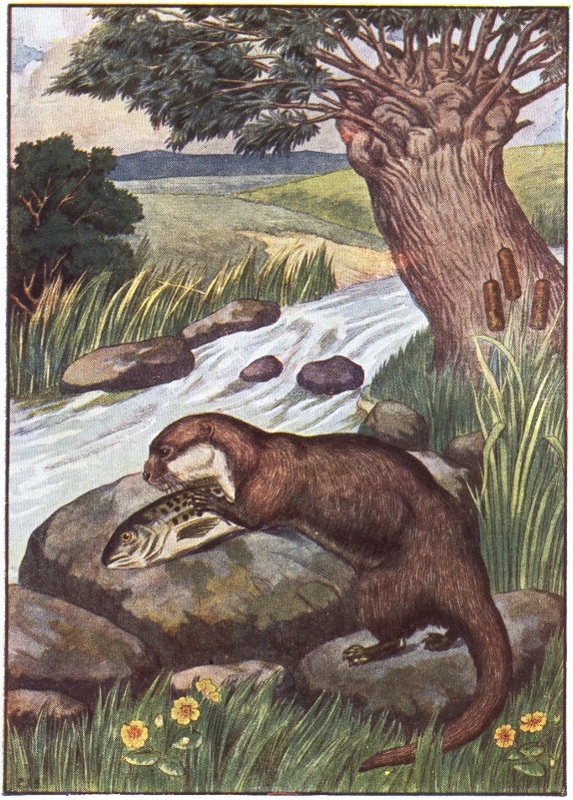 This children’s book plate illustration is in full-color and includes an otter enjoying a fish for lunch. Thankfully, the artist made the fish beautifully and left the actual eating to our imaginations. The otter has his meal on some rocks beside a rushing stream. He’s under a tree with yellow flowers and cattails nearby. The way the otter print is drawn, you could turn it into a picture of a tree by a stream or a picture of just the otter and his catch. You could also cut out some of the flowers and rocks to make a mini-picture to add to a larger work. Lots of options from this vintage otter print.